In April 1942 I was living at No.4 Cynthia Road, Oldfield Park. I was a young married mum with a baby son of 16 months named Chris who was just starting to walk and I was five months pregnant. As my husband was serving in the R.A.F., I was sharing part of his parents' home. They were both away up north that fatal weekend and their eldest son and his wife were sleeping in the house to keep me company. We went to bed at our usual time, when the sirens went at about 11.00pm. I went through my usual routine of pulling on my sweater and slacks, letting the side of the cot down, and lying on top of the bed torch in hand. Almost at once, the others came rushing in, urging me to come downstairs quickly. From their bedroom window they could see flares dropping all over the city and up on Lansdown. Before we could get down, the planes came over and the first bombs were dropped. Our shelter was under the stairs where a settee and a fireside chair had been placed since 1940. They were piled high with cushions and blankets and on a little table at the side biscuits and a flask of hot tea had been placed before we went to bed and normally drunk by the first person down in the morning. We quickly realised that we were being blitzed by the steady crump of exploding bombs and the rattle of machine-gun fire. The planes sounded closer and then the windows blew in. The street warden blew the 'immediate danger' whistle so we switched off the hall light in case it shone outside and put on a battery lamp which was dimmed blue. The noise woke up little Chris who sat up and started to imitate the sounds - 'whee, boom, whee, boom'. Every few minutes fresh plaster fell from the ceiling and more glass shattered. After a couple of hours it got quieter and then the All Clear went. We came out very carefully and by torchlight had a look around. The landing ceiling was down, blocking the stairway. The dining room and kitchen windows were shattered and the blackout frames were broken and torn. We managed to find the electric kettle and cleared the rubble from the cooker to heat some milk for Chris. My brother-in-law climbed up over the banister to look at the bedrooms and reported that all the ceilings were down and the beds were covered with plaster and broken glass. So we drank the tea, ate the biscuits, sat on the settee, put Chris to sleep on the end and tried to doze until daylight. Then to our horror we heard more planes coming over and the sirens howled again. This time it seemed worse. It was much noisier and the whole house shook. My sister-in-law got very upset, Chris woke up, the lamp gave out and the torch had no spare batteries. I sang so that Chris wouldn't know how scared I was, but it felt as if the house would fall down any minute. Then it started to go quiet and the All Clear went. Reg the warden from next door shouted "Are you all right? Don't move about, wait for daylight". In about half an hour, it was light enough to see that the wall opposite where we had been sitting was sagging in towards us at an alarming angle. The doors to the sitting room and dining room were jammed and the frames broken. The kitchen was wrecked with all the china smashed to pieces. The scullery roof was gone and most of it lay on the cooker blocking the pantry. We set to and cleared up as much as we could and partly cleared the staircase. We were filthy and covered in dust and debris but we managed to get upstairs to dress and wash. There was only a trickle of water and all the clothes in the wardrobes were covered in dust. We shook them out, wiped our faces and forced down what little food we could find, as we couldn't get in to the pantry. Then I noticed the phone hanging off the hall wall. I picked it up, complete with its board and dialled my husband's unit. I was put through to the Commander who was very helpful and said that John could take a 48 hour leave. A lorry was going to Bristol H.Q. shortly. It would take him that far and a travel warrant would enable him to get to me as soon as he could. I then remembered John's aunts, two old ladies who kept a newsagent's shop in Lower Bristol Road close to the Midland Bridge. Both were deaf and I had promised my mother-in-law before she went north that I would visit them daily. My sister-in-law had gone to find out if her parents were O.K. so I set off with Chris in his pushchair to see if John's aunts were still alive. I had no idea of the damage that Oldfield Park had suffered or the difficulties I was to face. Moorland Road was a mess as most of the terraced houses in the area had some damage and their owners were trying to board up windows etc. The Post Office. 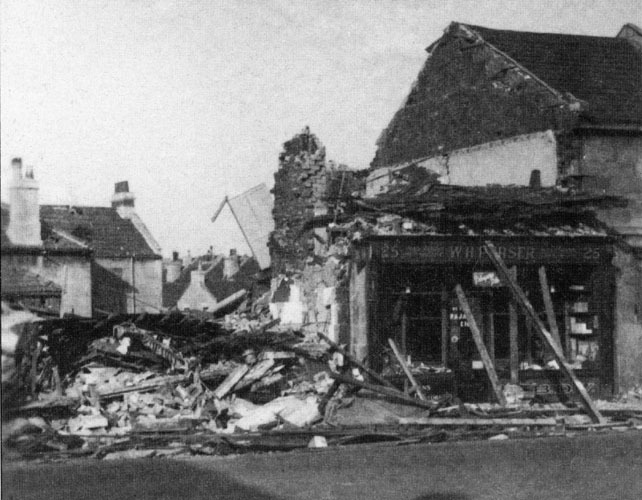 In Moorland Road was very badly damaged and most of the goods from the grocery side had been blown out into the street. 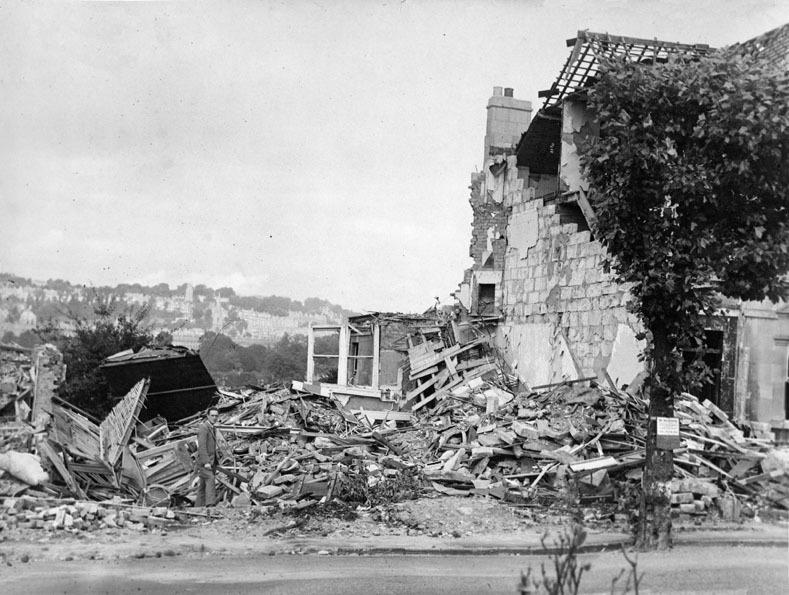 (By the time this picture had been taken, the post office, which had been the building to the left of the photograph, had collapsed completely. W H Purser's stationery shop, seen here propped up to prevent it falling into the street, was subsequently demolished. I couldn't get up Stanley Road, so I went down the back lanes. Lower Oldfield Park was closed. 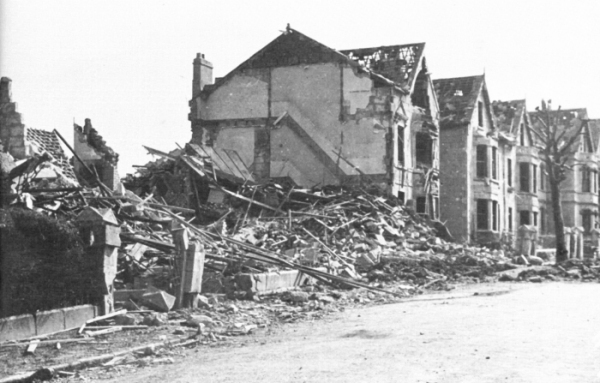 Many large houses had gone and there was still the danger of unexploded bombs. (The picture on the right shows the ruins of the Medical Centre which was at number 101 Lower Oldfield Park). The Brougham Hayes bridge was damaged. In Victoria Terrace and in the little roads off it, many houses were down and rescue services were trying to dig people out. I wasn't allowed to pass for quite some time as they were listening for sounds from those still buried under the rubble. I saw many brought out. Some were badly injured and some were dead. With the smell and the dust it didn't seem real. Then I was beckoned through and I hurried on. The fact that there was nobody about up here along the road helped. At the bottom I realised that there was no traffic or people. As I turned the corner I realised why. A huge mound of earth from the cemetery blocked the Lower Bristol Road. There were coffins, skeletons and all sorts of debris. What was I to do? I must have been mad because I took Chris out of his pushchair and told him to keep his arms around mummy's neck. I climbed up, dragging the pushchair behind me trying not to look at the sights around me. I pushed things out of my way while trying to ignore the terrible smell. At the top I slid down, and waiting for me at the bottom were two astonished wardens who scolded me for what I had done. I gasped out "what has happened to Mrs. Gradwell and Miss Coward?" They replied "they're all right. Their old brother came in his car and took them off about ten minutes ago but they had a narrow escape." It appears that the front of house and shop had been blasted away but their two beds were on the edge. They hadn't heard the sirens or the planes and the firing. They only woke up screaming when the land mine came down in the cemetery. The wardens couldn't see them or show a light so they used a loud hailer to tell them not to move until daylight which when it came revealed their danger. If they had got out of bed they would have fallen into space. The wardens then got the fire engine to raise its turntable ladder and they were helped down the stairs although at first they refused to do it with out their dressing gowns. Miraculously they didn't have a scratch on them and because they hadn't experienced the trauma of the raid, they were fully recovered in a matter of hours although many of their neighbours were not so lucky. 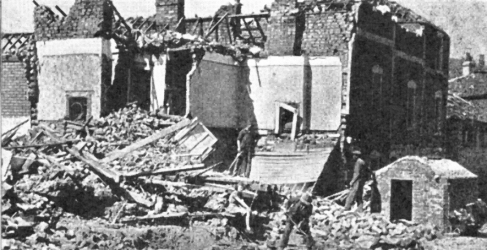 (This photograph shows Westmoreland Street just round the corner from their home - notice that the small air raid shelter on the right of the picture was undamaged!). I was given a hot drink and a letter to show the Pioneer Corps who were working in Oldfield Park that I needed to get back to Cynthia Road. I was escorted through and got back just in time to see my relatives leaving in a taxi for Bathampton where they lived. "What about me?" I asked. They replied "you stay here until John arrives, we've got to get back home," and off they went. I could boil a kettle but I could not get into the pantry to get food. The people next door brought me in some toast as their house wasn't so damaged. Reg the warden was also a builder so he took a look round. "You can't stay here tonight. The middle wall is sure to go if we get another raid," he said. So I packed a bag for Chris and myself and collected my father-in-law's tin box of papers that he kept under the stairs for safety. "Always take them with you if you leave the house," he had instructed. John eventually came about 4.00pm. Although the buses had just started running, it had taken him 7 hours to come 20 miles. He quickly took charge and made the decisions. "You can't take those bags or father's box or the pushchair. Just take some nightclothes, a wash bag and things for the baby. We will come back for the rest in the morning." Reg said that he would make sure that no one came into the garden. The front door was bolted, the side gate padlocked and we set off. There were no taxis to be had and all the phones seemed to be down. The buses that passed going to town were packed and we couldn't get on. A bus driver on the way up saw John's uniform and stopped. "Get on and go up the front and don't show yourself at the terminus or the queue will go mad," he said. Chocolate was very scarce during the war, so feeding it to a dog was a real extravagance. We went to the Abbey and then we had to walk to Bathampton. It was getting dark when we got there and we were exhausted. We were given a drink and piece of cake. There were friends there who had been invited to stay the night and they had a dog, which they fed with chocolate, but had none to spare for Chris. I slept on a camp bed in the box room with Chris on a bolster on the floor. John was assigned a fireside chair. Within an hour another raid started in the city and we all trooped outside and down the stairs to the cellars underneath where we sat in deck chairs. The sky was all lit up with the fires that were raging in the city. The supply of water had dried up as the mains had been bombed and the street tank had been used up. We could hear the bombs but it wasn't that close but we wondered what would be left by morning. Just after 3.00am the phone went upstairs and Cyril ran up to answer it. He returned ashen faced. "No. 4 Cynthia Road's gone, a direct hit from a stick of Molotov cocktails". We were stunned. Everything we owned had gone. But suddenly I felt as if I had experienced a miracle. I remember shouting "We're alive, all of us and not injured. Possessions don't matter, we are so lucky. Although another horrific day lay ahead and we saw more terrible sights and had some nightmare experiences, I had learned a valuable lesson that has lasted me a lifetime. When Ruth referred to Stanley Road, she meant Stanley Road West, and not the Stanley Road that Joy lived in. There is a picture of the damage in Victoria Road and Victoria Terrace in Maureen's story. The cemetery that was bombed and caused the Lower Bristol Road to be blocked was St James Cemetery. Wartime records show that two 1000Kg bombs and a 250Kg bomb landed in the cemetery the first night. The following night, three more 250Kg bombs landed there. Ruth's husband's aunts lived above a newsagents shop on the Lower Bristol Road near Westmoreland Street. Ruth's description of the problem with the bus needs clarification. Unable to get on a bus going into Bath because they were all full, Ruth and her husband John got on a bus going in the opposite direction, travelled on it to its terminus, then stayed on the bus when it turned round and headed back to Bath. If there was a long queue at the terminus, some would be unable to get on. The driver did not want them to know that Ruth and John had arrived on the bus and did not get off, thus using up two seats and preventing two new passengers from getting on. A Molotov Cocktail was an incendiary bomb with an explosive charge, which went off once the incendiary was burning to spread the fire around. Lower Oldfield Park was badly bombed. This picture shows the buildings about 300 metres (320 yards) further along than the Medical Centre pictured alongside Ruth's narrative.